Four Pakistani terrorists infiltrated an Indian Army base and killed sleeping soldier in their barracks in Uri. India replied with Zero Dark Thirty style over the border attack called 'Surgical Strikes'. It's shot well, and despite being a patriotic revenge drama it remains soulless. 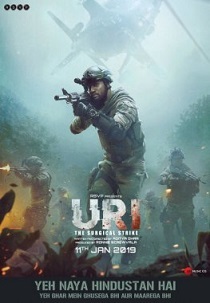 After watching Uri: The Surgical Strike, Syed Firdaus Ashraf gets the feeling that Modi has added another tool to help him win the 2019 Lok Sabha election: Hindi cinema..
Vicky Kaushal Manages To Hold Your Breath In This War Film! A War Movie Bollywood Can Boast About!